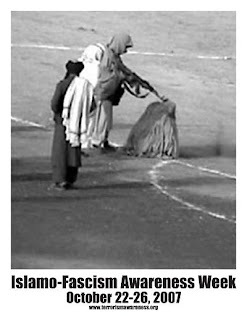 Today, October 22nd, is the first day of Islamo-Fascism Awareness Week. It is a nationwide event, hosting speakers on campuses across the United States. Here's a list of colleges participating: Student Guide. And the calendar of speakers. The purpose of the Week's events is to make students aware that their college avoids the subject for politically correct reasons. But Islamic fundamentalism is an important human rights issue that should not be ignored. Particularly, women's studies departments turn a blind eye to the egregious human rights abuses in the Islamic world. This shocking oversight (or deliberate disregard) is shown in these studies of university women's studies departments. One of the activities on the campus is handing out a booklet called The Violent Oppression of Women in Islam. You can read a PDF document of the booklet here: Violent Oppression PDF. You can read more what goes on in Islamic theocracies, and see a ten-minute video (if you have a strong stomach) here: The Violent Oppression Of Women In Islam. In that same article, you'll see a list of universities participating in the event, and specifics about who will be speaking and when, and in what room. If you've got a college near you, check out the list and participate in the event. It should be interesting and educational. If all this information motivates you to want to do something about it, check out the last third or so of this article for practical ideas: Women Are More Than Abused In Islamic Theocracies. More then 100 years ago, the book Uncle Tom's Cabin exposed the indignities of chattel slavery. The educational events of Islamo-Fascism Awareness Week modestly seek to enlighten the nation's youth about the incalculable costs of Islamic extremism. Silence is Islamo-Fascism's greatest ally; after viewing this film, every incensed conscience will scream that silence can no longer be tolerated. Great piece, excellent blog, tremendous work, you be linked, thanks! "See, Islam is NOT a race either. And by the way, the Bible doesn't say to convert, conquer or kill non-Christians; like the Koran says to do to non-Muslims. So there YOU RACIST hater of non-Muslims! You're a Kuffarphobic!" Be careful all you in London Friday 10/26!